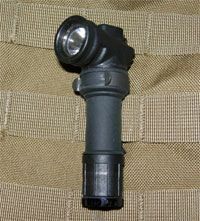 PentagonLight, a leading producer of handheld and weapons-mounted light systems in the US, recently introduced a small handheld light called the MOLLE Light. MOLLE, as most Police Marksman readers are aware of, stands for modular lightweight load-carrying equipment, a system introduced to the US military several years ago. This system consists of nylon or Kevlar reinforced straps attached to packs, vests, etc. that allow the fastening of magazine pouches, radio pouches and virtually any type of carrying case that has a clip that can be attached to the MOLLE straps. The MOLLE light comes with a double-point pocket clip that is reinforced for hard use, as well as an integral lanyard loop. Along with being designed with military use in mind, the MOLLE light comes with an optional compass in the base of the battery compartment (and it really works in spite of its miniaturization!) as well as blue and red light filters. Available in black and light desert tan this ergonomically designed little light is operated by a push button on top of the light, which when depressed half way allows on/off use of the light and when fully depressed allows continuous run of the light. This is a solidly built handheld light that we've carried hooked to our belt for a week and find it convenient to use and unobtrusive. The ability to clip to something makes it ideal for attachment to tactical equipment and when activated in the continuous on position allows handsfree operation.